Jeff also watched Sebi coach pupils at the school. Jeff, a former governer of Parrs Wood High school, said: “It’s great to see young people doing such fantastic work in Manchester. Sebi said: "It was great to be able to coach some of the year 8s at Parrs Wood High School. They performed so well! "It was good as well to meet and talk to my local MP Jeff Smith and to be able to show him what an exciting, great game handball is. "Handball has helped me to meet and make new friends whilst keeping fit and healthy, and visit other parts of the world. 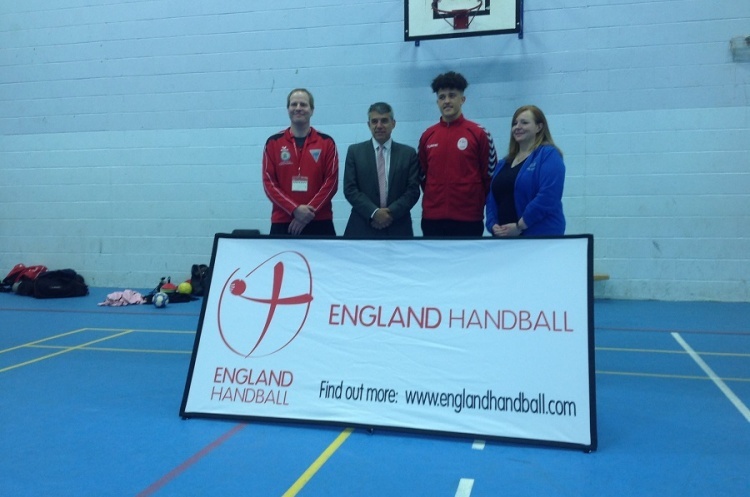 "The talent pathway which England Handball has developed really does help young people like me to develop the skills required to progress to any level they want to. "Handball is fast paced and energetic and so exciting to play. You don't need any experience if you want to give it a go. You could ask your teacher about playing it at school, or contact your local handball club, which you can check on the England Handball website." Sebi, who recently received an achievement award from Manchester Sport Foundation in partnership with GLL’s athlete-support programme, the GLL Sport Foundation (GSF), and Manchester City Council, has progressed through the England Handball Talent Pathway. He was selected in the England Under-16 squad that played in the Cell Cup International competition in August 2016. England came second in their group during the tournament, with Sebi top scoring for the national team. He has been selected to represent the England National Academy (under-16s) again this year, in the International Competition in Viborg, Denmark. Sebi, who plays for Warrington Wolves under-18s, took up handball at Parrs Wood High School. He was encouraged by his PE teacher Ms Waterhouse to join the training sessions at Mancunians Handball Club. He then trialled for Greater Manchester County level where he played for two years. He was a member of the team which won the National County Championship in 2016. He was also part of the North-West Regional Team which came second in 2016 and went on to win the National Regional finals in 2017.